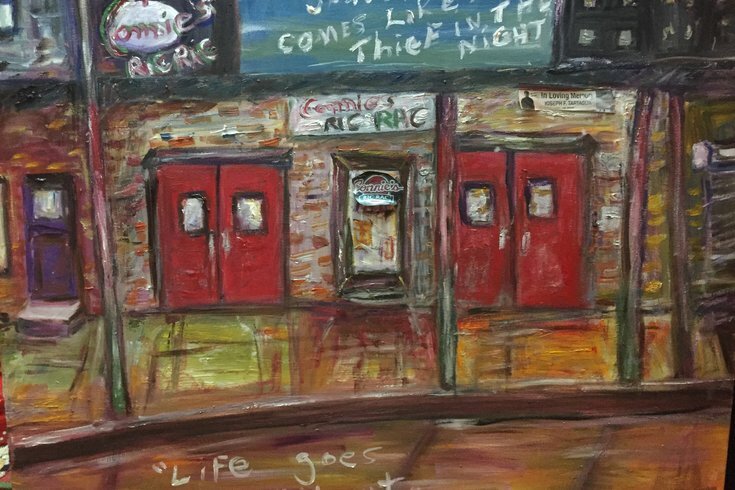 An oil painting of the facade of Connie's Ric Rac, by Connie Tartaglia. When Connie’s Ric Rac opens its doors on Sunday afternoon at 3 p.m., a familiar name (if not the face) will present her work in a live setting. No, Connie Tartaglia will not pound drums or strum guitars. She won’t even hawk the bric-a-brac that she once sold there when she and her husband, Joe Tartalglia, opened Connie’s Ric Rac as a tchotchke shop in the 1980s. “We got the sign all wrong and missed a few letters,” she said with a laugh about the shop she kept open for nearly 20 years. Instead, Connie – the mother of Frankie and Joseph Jr. who opened the Italian Market live venue in 2006 – will display her paintings for the first-time ever at the Ninth Street salon in a retrospective exhibition. “I was never going to show these outside of my house, because it’s so personal – I always painted for me – but I’m doing this now in Joey’s name,” said Tartaglia. She will open her work and her heart solely in order to benefit the National Brain Tumor Society in the name of Joe Jr., who passed in 2013 from glioblastoma, an aggressive form of brain cancer. “Joe and Frankie talked me into it," she said. Along with selling her paintings solely for the benefit of the cancer charity, there will be musical performances by The Spinning Leaves, Katie Barbato, Daniel Collins, Kelvin Cochrane, and The Discount Heroes. Connie Tartaglia won’t put aside the sadness she feels from losing her oldest son, (“that will never happen”), but she will put on a brave face while displaying paintings, old and new, of the Italian Market where she was raised, the sons that played there, and the produce stands and bustling street scenes forever familiar to her. “The neighborhood hasn’t changed that much,” she said, considering that on the 7th and Wharton streets block where she grew up watching and painting her Sicilian immigrant stonemason father, there’s still a little grocery-convenience store on the street. Another thing that hasn’t changed too much in terms of proximity is her relationship to Joe Tartaglia Sr., her husband with whom she built an Italian Market dynasty of produce stands, rental properties and personal and professional investment. “When we were kids, his family lived right next door to mine,” she laughed. 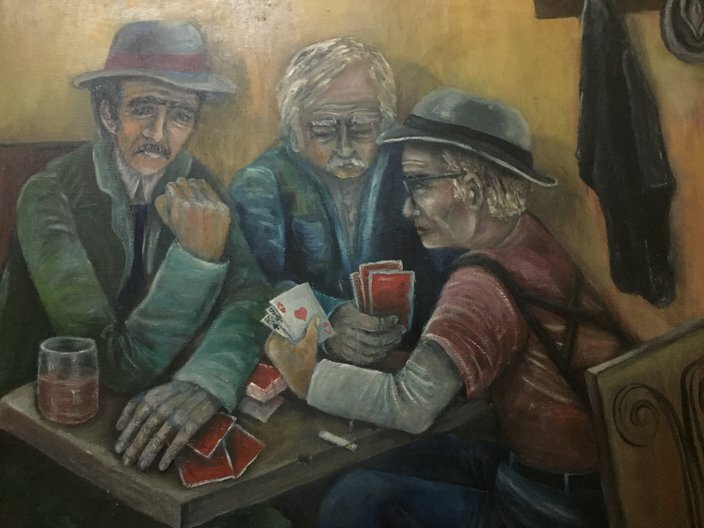 An oil painting of men playing poker in the Italian Marker, by Connie Tartaglia. Whether on 7th Street or the Italian Market apartment they had for a time being, Connie Villari (her maiden name) or Tartaglia painted. She learned the basics of art in grade and high school, and fell in love with the form when she took classes as an adolescent at Catherine Street’s Samuel S. Fleisher Art Memorial. She put down the brushes when she first got married, but picked them up again – as well as additional classes at Fleisher – around the time her son, Joey Jr., was born, and made him a subject of her work at that point. Painting after 2013, after her oldest son died, was a form of therapy – a way of dealing with deep grief and utter sadness – with several paintings from that period picturing Joey Jr. doing everything from eating lobster to listening to music. “Those painting are for me, and I don’t think I will be displaying those,” she said. Fundraiser Benefit for the National Brain Tumor Society & Retrospective of the Artistic Works of Connie Villari Tartaglia is Sunday, Dec. 17 at Connie’s Ric Rac, 1132 S. 9th St. Show time is 3 p.m. For more information, call 267-908-4311 or click here.